From the moment my daughter was born a few years ago, I counted the days until I could ride with her. I wanted to show her the world at 15mph. I wanted her to experience the sense of independence and wonder of riding yourself to new places both physical and mental. I wanted her to enjoy cycling as much as I do, but after dragging her in a trailer as an infant and toddler, I figured we wouldn’t get to really put in miles together until she was 10 or 12. But then I tried a trailer bike. My daughter loved it from the start. She got her own seat, bars, and pedals she could reach and she could feel the wind in her helmet as the pavement passed quickly underneath. We went from short, complaint-filled rides in a trailer she was quickly growing out of to luxurious miles filled with her joyful laughter and blissful singing. After our first practice ride grew from riding in our neighborhood to a few miles of riding through surrounding neighborhoods, I knew the trailer-type bike was going to be a hit with both of us. A week after buying one, we were riding the five miles downtown to the ice cream shop and back for after-dinner treats. I take her to day care and pre-school, both a few miles away and she enjoys every minute of it. A couple weekends ago, we packed up both my bike (with the tag-a-long) and my wife’s city bike for a picnic and trip to the library and back. We’ve repeated that trip several times since. Installation varies from manufacturer to manufacturer, but they’re all pretty straightforward. You pick out whatever seatpost adapter is necessary based on seat tube diameter of your bike. Two brands of trailer bike I’ve tested both had a small amount of side-to-side play built into the trailer hitch mechanism, and some trailer bikes fold up for easier storage. They’re generally cheap, around $200, so they are built with mild steel tubing making the whole rig weigh quite a bit with a child aboard. 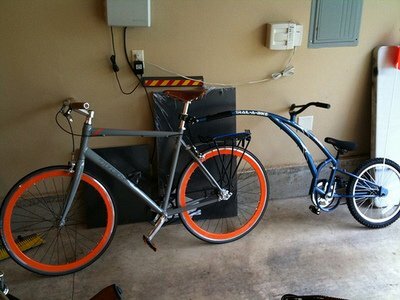 It works fine on my own city bike, but my wife that weighs almost half as much as I do has trouble on her lightweight aluminum road bike when we tested it with the trailer bike (likely due to the trailer bike + 4 year old daughter weighing about 75% of my wife plus her bike). The side-to-side action of riding with a co-pilot that doesn’t yet know how to balance a bike can be challenging at times, but if you connect it to a stable bike in the first place (me, I attached it to my flat bar city hauler) it’s not be too bad. Special attention should be paid to the sizing of a trailer bike as some are more flexible than others and 4-10 year old kids can vary greatly in height. Trailer-type bikes are wonderful ways to share cycling with young members of your family and a great way to leap-frog from the infant trailer to riding several miles on the streets with a parent. For parents with 4-10 year olds looking to share their passion for cycling, I can’t recommend trailer bikes enough. Matt Haughey created MetaFilter, Fuelly, and a whole host of other web projects. He’s currently helping run a bike team and headed to Interbike later this month to help out with Bike Hugger coverage.